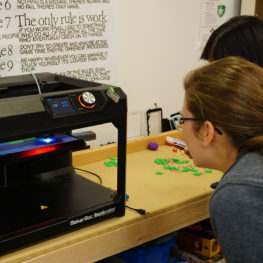 Stop by to learn the basics of 3D printing. This will be an entry-level walk-through, so no previous experience is needed. We'll cover the process of loading and unloading filament, 3D printing websites, and some basic CAD software to get you started. Stop by to learn the basics of 3D printing. This will be an entry-level walk-through, so no previous experience is needed. We’ll cover the process of loading and unloading filament, 3D printing websites, and some basic CAD software to get you started.